Today, August 27, 2012, the United States Mint will be releasing bags and rolls of the 2012 Hawaii Volcanoes National Park Quarter. The new product options containing the fourth 2012-dated release of the America the Beautiful Quarters® Program from the US Mint will become available at Noon (Eastern). Buyer's actually have a total of five different choices with the release of the Hawaii Volcanoes Quarter today. All five contain standard circulation quality strikes, however, the minting locations of the coins included in the products vary. 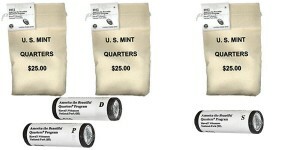 The US Mint's standard shipping and handling charge of $4.95 per order applies. 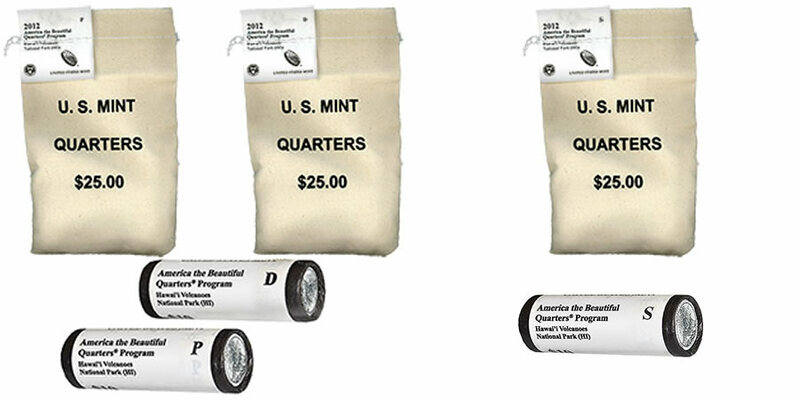 Of the five new products listed above, the Philadelphia and Denver struck products are a continuation of similar products available from the US Mint since the debut of the America the Beautiful Quarters Program in 2010. However, the San Francisco struck products only made their debut earlier this year as a new option from the Mint. All of the above products contain coins with the same obverse and reverse imagery. The obverse showcases a portrait of George Washington, by John Flanagan, seen on quarter dollars in one form or another since 1932. "The reverse of the fourth quarter of 2012 depicts an eruption on the east rift of Kilauea Volcano. Inscriptions are HAWAI'I VOLCANOES, HAWAII, 2012 and E PLURIBUS UNUM. It was designed and sculpted by United States Mint Sculptor-Engraver Charles L. Vickers." This newest America the Beautiful Quarter will also be released into general circulation today by the Federal Reserve Bank System. An official release ceremony for the new quarter is scheduled for Wednesday, August 29th at Kahua Hula, south of Kilauea Visitor Center at the Hawaii Volcanoes National Park. The ceremony is scheduled to start at 1:30 PM (Hawaii time). After the ceremony, a coin exchange will be offered where attendees can exchange cash for rolls of the new release.